Working in the movie or television industries doesn't necessarily demand interested individuals must be actors or directors. There are a multitude of other essential positions which must be filled by qualified professionals in order to complete filming the projects. One such position of utmost importance is the camera operator. Camera operators capture the stories told by the actors. Camera operators must use an array of camera techniques and editing skills to produce images which convey the story as it is intended to be chronicled. This is accomplished through the compilation of numerous camera shots; taken at different angles, in various lighting. A camera operator must be creative, technically skilled and capable of maintaining a steady hand to ensure images are not overshadowed by unnatural movements. Camera operators are employed in numerous capacities. 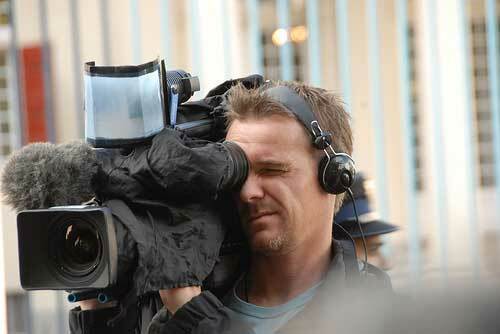 The television and movie industries require the services of professional camera operators. Camera operators may shoot news and sporting events, documentaries, television series, studio programs, even music videos. A camera operator may specialize in any of these areas; developing an expertise which will be in demand by those seeking skilled and knowledgeable professionals. Cinematographers, or movie camera operators can specialize in certain types of films; cartoons, claymation or special effects. These individuals will need to know the various methods and techniques used to communicate the scene as it is intended to be relayed including mounted still scene shots, track shots and varying angles. The profession isn't limited to only the commercial industries. Camera operators are also used to shoot private events and ceremonies. The demand for camera operators and editors will not be as great as the number of individuals seeking employment in the field. Significant competition should be expected by anyone intending to seek professional employment as a camera operator. Even though the expectation is that the competition will be fierce, there is job growth projected in the field. The United States Department of Labor reports that the rate of employment will grow by 11 percent, about the average rate for all occupations. Some of the growth is being attributed to the internet revolution. An increasing number of start up and established organizations are broadcasting films made specifically for the purpose of internet broadcasting. This new aspect of the industry is expected to make up for the slowing rate of positions for camera operators in television broadcasting. Preparing for a career as a camera operator begins in high school. High school equips students with the foundational skills necessary to be successful in future employment, especially professional and technical positions. Students will develop skills in problem solving, analytical and critical thinking and communication. Completing courses in the basic subjects of mathematics, science, social studies and English will satisfy the admission requirements prescribed by colleges and ensure students are knowledgeable in the principal subjects needed to develop a more complex understanding of the professional world. Additionally, colleges require students to complete two years in a foreign language, at least one year in music or arts, technology and computer. The college preparatory curriculum incorporates all of the courses required by colleges to be considered for admission. Most high schools have developed an affiliation with a technical high school. The technical high schools offer trade specific curriculum. The curriculum focuses on teaching the career skills associated with the profession through academic study of theory and extensive hands on practical application. Students learn the basics of camera operations, computer technology, various processes and techniques involved with videography and camera use. Early training in these skills will enable students to develop an inherent understanding of the practices; allowing them to concentrate on the creative and artistic aspects of the industry instead of the nuts and bolts of the field. It is important to make sure, prior to deciding on and committing to a technical high school education, the school's curriculum encompasses all of the college admission requirements. Otherwise, a student who intends to attend college after high school may find they are unable to gain admittance. All high schools offer opportunities to participate in a number of extra curricular activities. Students should consider joining any type of audio-video club. Participate in creating the school's electronic year book. If the high school isn't creating one, suggest an electronic year book to the administration. Computer clubs, school newspapers and photography clubs also help develop skills which are useful for someone entering a field in video production. Colleges have a predilection for students who contribute in more than an academic capacity to their school. These activities also offer benefits in terms of experience. Students develop collaborative and leadership abilities through the various organizations, clubs and activities. After school and summer employment can be obtained at local television stations. Many of the stations offer unpaid internship opportunities to promising students. Technical schools will teach many of the professional and specialized skills associated with the industry, but many may not offer additional training in the general skills relevant to all professions. And though associate degrees are a great beginning, and sometimes enough to attain an entry level, the program doesn't allow sufficient time to cover the amount of information and material that the bachelor degree program does. Most employers require prospective applicants to have earned a bachelor degree. Bachelor degree programs provide a general education curriculum in addition to career concentration courses; enriching the cognitive and practical abilities of the graduates. Students enrolled in bachelor degree programs have the opportunity to select elective courses with relevance to their intended profession. Film students would benefit from courses in business and art; as both are integral aspects of the industry. Computer training will help develop technical skills essential to the film industry. Students will need to be familiar with and proficient using the most popular and prevalent software programs and tools. Capturing a story on film is not as simple as pressing record on the camera. Students will require training in the various aspects of camera operation and specialized study in certain areas of concentration including journalism, film and photography. Students should seriously consider choosing a college which specializes in film production as a major. There are a number of institutions of higher learning from which an aspiring camera operator can choose which are labeled as film schools.A film school will be exceedingly familiar with the subject areas germane and pertinent to a camera operator's functions and will emphasize studies in these disciplines. A college which doesn't specialize in film will still provide a quality general education but may only skim over the other areas of significance. The additional training will ensure graduates of the film program will be versed in all aspects of the industry, not just the most prevalent areas. In addition to the technological areas, camera operators will need to be trained in the creative arts. Creative art training ensures individuals will be knowledgeable in the artistic principles and ensure they sufficiently develop the skills. As is true for the majority of the creative arts fields, a camera operator should create a professional portfolio of work to present to prospective employers. Employers prefer to hire individuals of who they are confident will be able to provide the high level of work and professional standards expected. A professional portfolio provides evidence of the level of work of which the job candidate is capable. It is important to only include completed projects and only those which best represent the highest quality of work of which you are capable. If you have an area of specialization, highlight it within the portfolio by dedicating the majority of the portfolio to those projects within that area. Include in the portfolio as many projects as possible so that the employer will feel confident that you are able to consistently provide high quality work. It will also assure the employer that you are capable of developing and implementing a vast spectrum of projects. Internships are an important part of the learning process for camera operators. Camera operators will need to experiment with and attain experience with using the various pieces of equipment associated with the profession. An individual will not be able to develop a proficiency and eventually an expertise in the field without hands on, practical experience. Internships provide the opportunity to do both. Individuals will learn from watching professionals and from the instruction they will receive from the same professionals. Spending time in the environment will familiarize and prepare future camera operators for the type of stress associated with the field. Individuals will learn to cope with and solve common issues that arise. The networking connections gained from internships also prove invaluable once the camera operator enters the field as a professional. The film industry is as subject to advancements in technology and techniques as any other industry. Taking continuing education courses at local colleges and trade schools will help professionals in the field remain abreast of changes and advancements. Completing these courses will ensure you remain competitive in the field and are able to provide the best possible service. It will also augment your professional resume. Continuing education can come from other sources as well. Check with the college where you obtain your degree to find out if they offer professional certification courses and continuing education opportunities. Some schools offer their graduates life long learning courses without tuition costs. Professional magazines and journals provide invaluable information. Seminars, lectures and workshops are other methods of obtaining continuing education information.